Well, it's that time. With the holidays fast approaching (or already here for some people) I am very excited to announce the very first winner of NextGen Player's and Eh Button's "Come Out And PLAY!" contest! And the winner is Stephen Shim - congratulations! Stephen has won himself tickets for two to see PLAY! 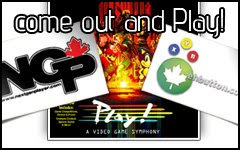 A Video Game Symphony performing live on January 9th in Edmonton, Alberta. Of course as per the rules of the contest, all winners must be legal residents of Alberta. I will be emailing Stephen to verify his location tonight. As a reminder, we are still accepting contest entries until January 4, 2009 at 11:59pm ET. Next week the team at Eh Button will be selecting our second winner. Congratulations once again to Stephen!